HTML Email templates and Email alerts are one of the integral parts of almost any site. These letters of registration, newsletters, and even letters in order to attract new customers (online marketing). Moreover, more than 50% of the letters being opened on mobile devices, a trend that has been growing steadily the past few years. Recently was designated another tendency – responsive template, and, as you know, the importance of responsive styles in the templates of letters is quite high. Today we have prepared for you a responsive template that you can use in your projects. This template is perfectly supported by most email clients and services. The template consists of several parts: invisible introduction part (just in case), main header, content part, where you can put your texts, images and buttons, and footer part. 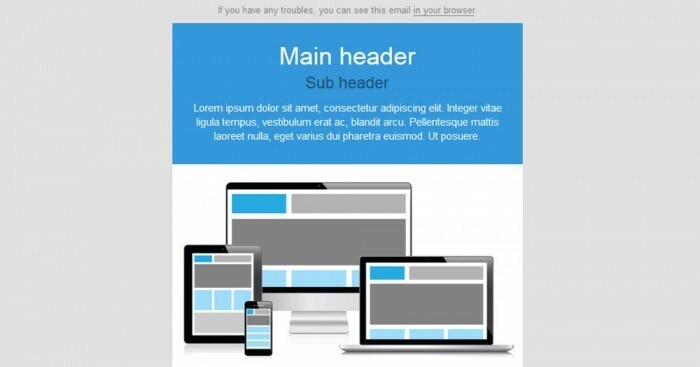 Here you can put short introduction of your email template. If you have any troubles, you can see this email <a href="#" target="_blank" style="text-decoration:none;border-bottom:1px solid #828282;color:#828282;"><span style="color:#828282;">in your browser</span></a>. .. here will be our custom content sections ..
You can also change the layout of the page by moving the entire paragraphs and separators. I had already divided all these parts.